Another segment of David’s music collection is from the world of jazz. He has created a series of pieces that are showing up in the recreation and music rooms of many homes worldwide. 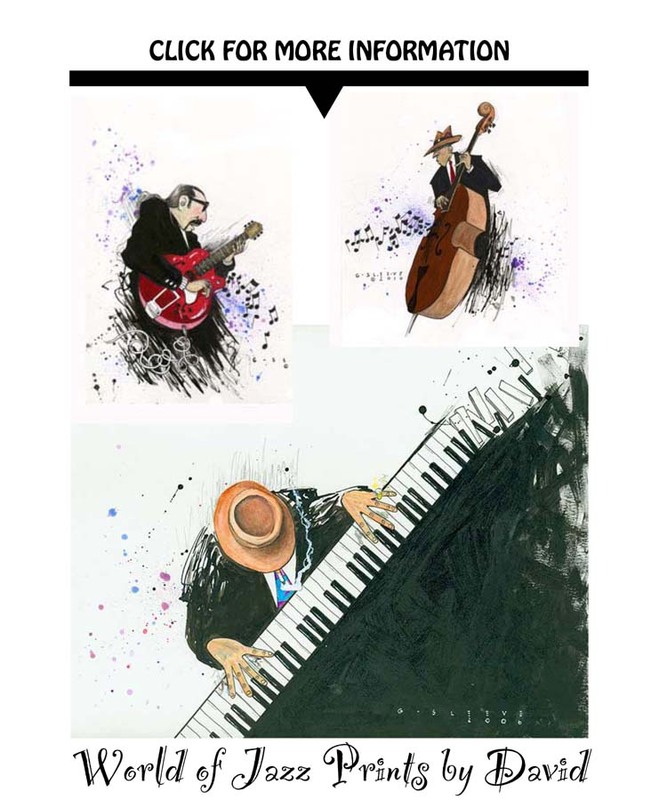 He has pieces that depict base fiddlers, guitarists, pianists, trumpeters, trombonists … something for everyone. These are ideally suited to having multiple prints displayed as a grouping. You can almost hear the music flow. "Loose Keys" is one of several prints in David's World of Jazz Series, and it has remained one of his best sellers. You can almost hear the piano keys tinkle and the jazz refrains loom. Click for more information and to order. The "Bass Fiddle" print comes from David's World of Jazz Series, and it complements others in the series. They are often purchased and displayed together to project a great musical scene for the jazz enthusiast. Click for more information and to order. The "Guitarist" is another print from David's World of Jazz Series. This intense musician is deep into keeping time and complementing others in the band, as he plays chords, melodies and improvised solo lines. What makes a great Jazz guitarist? Flamboyance - technique and a dash of magic. Click for more information and to order.